If you haven't heard yet, Barnes & Noble is closing the UK NOOK store. This comes after they closed down all of the other markets besides the US and UK over the summer. With most of the ebook sales going through Amazon and Apple, it's no wonder that B&N is having trouble, but were it simply brick and mortar stores that failed there wouldn't be an issue, or if the ebooks had been priced as essentially disposable content, or if the ebooks hadn't been saddled with digital rights management (DRM). For most things in the world, when you pay for them you own them. If you pay for your hamburger you can choose to eat it, spray paint it red and frame it, or throw it at a passing unicyclist while they try to hit you with their lance made of straws. But digital ownership is different. You don't own your copy of your computer's operating system, you only have a license to that OS granted by the software maker and, if they so decided, you could be kicked off of your computer in an instant. That wouldn't be very smart for a company to do when they want to make money, but what happens when a company can't make money? What happens when a company like Barnes & Noble can't support the software they created? When there's DRM involved what happens can be pretty terrible. Even though I don't own my OS, I could still run it offline, make changes as necessary, and get along fine for a while if the software company decided to cancel my license. If my MP3 collection were to suddenly be turned off by the company that hosts it, I would still have the copies of the files on my computer that I could listen to, just without the convenience of listening to them everywhere through the cloud service. But some levels of DRM prevent copying files from one location to another, some DRM requires internet access to verify the validity of the file and the reader hardware. These tools exist to prevent piracy, but usually only serve to annoy honest customers. Unfortunately, when the company that instituted the DRM goes out of business, there may not be a legal way to continue to use the files that you have paid for. Most ebooks published by the major publishing houses are around $10 apiece, while most ebooks published by independent houses or authors are around $3. I don't want to get into too many of the arguments about the difference in price. There are plenty of voices on both sides of that debate. Where it comes into play here is in what you can or cannot do with that ebook once you've paid your money. If you bought a paper book, you could sell it to a used bookstore, you could loan it to a friend, you could pack it in a box and ship it around the world, or you could leave it on your shelf until you decide to read it and then know it will be readable. But with an ebook you can't sell it, you can't loan it (most of the time), you can't send it to anyone else, and if you leave it on your digital shelf, you have no guarantee that you'll be able to read it in the future. One of the key pieces here is that the ebooks published by the major publishing houses also employ DRM so you can't make copies, you can't make a backup for yourself, you can't change formats, you can't do anything with that ebook but read it on the devices that are approved. You are, essentially, renting your ebooks if they have DRM (note that I won't voluntarily put DRM on any of my ebooks or stories). And, if you are paying the higher price demanded by the major publishing houses, you are renting a book in electronic format that is less versatile, less capable, and less long-lived than a paperback that might be the same price (or cheaper if you get it used). Businesses exist to make money and they do that by providing a good or service. Right now the publishing industry doesn't know what they're providing or how to make money off of it. In the past publishing provided a good: books. That physical thing had value that could be exchanged for money. 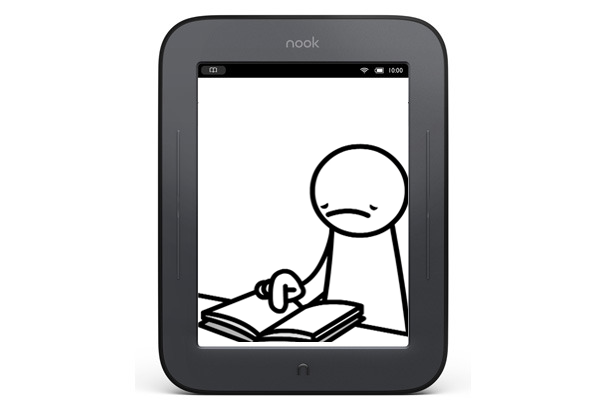 But now with ebook readers and ebooks what's being sold isn't exactly a good. There isn't a physical thing with value. But neither is it completely a service because each book is valued differently and separately. The major publishing houses are trying to retain the goods-model of pricing while independant publishers are gravitating more toward the service-model of pricing. What this means for readers is similar to what shift toward digital music has meant (or digital video, or digital news). Namely, readers will have to be more aware, more vigilant, and more flexible with the increased options. As an author I want to make this as easy as possible for you. If you have a copy of any of my books on your NOOK platform (regardless of which region you're in), let me know and I'll get you a DRM free version for your platform of choice. I know that may not be the way to make the most money, but it's the way I would want to be treated, so it's the way I'll treat my readers.